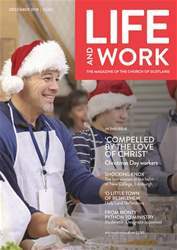 Digital Subscriptions > Life and Work > December 2018 > This is Christmas? The Rev Dr Margaret Forrester considers the message of Christmas from the perspective of the innkeeper’s wife. THE gospels devote up to a third on the last week of Jesus’ life. Mark doesn’t mention the birth. John gives a theological statement. From the puzzling narratives of Matthew and Luke we have built a strange fantasy that we call Christmas. All the gospels imply that the birth narratives are only important if they point to the cross and resurrection. We have decorated our nativity with cattle and donkeys, holly and ivy, trees and Yule logs, snow and candles, tinsel and glitter. We have imagined so much, let us imagine one thing more: an innkeeper’s wife, a weary and grumpy innkeeper’s wife.